It may be the 28th of January, but for me it’s the first day of spring. I spent a busy afternoon today repotting two of my citrus trees, splitting and potting up various carnivorous plants and sowing the first seeds of the year – mainly chillies. The chillies and sweet peppers need a long growing season, so I always start them early in my dad’s propagator in the limery. I don’t own many things that belonged to my dad, but his propagator is a valued possession and I know he’d be delighted that I’m still using it. This year, with my new interest in Mexican food, I have planted six varieties of chilli: lemon drop, chocolate habanero, jalapeño, black Hungarian, serrano and ancho. Fingers crossed for good germination. Us Brits are well known for being weather obsessed, so you will forgive me for telling you that the past few days have been glorious. The weather has been lovely and so this weekend has been all about planting. I had intended to complete my sketchbook contribution this weekend, but the timing of the good weather made it ideal for planting some of this year’s crops. The forecast for next weekend (when there are two bank holidays) is poor, so crafting is much more likely then. In the past few days I have (whist wearing my new apron) potted up tomatoes and sowed lots of seeds: squashes, courgettes, a variety of purple sprouting broccoli that sprouts in the summer, chives, parsnips, asparagus peas, various lettuces, mizuna and rocket. I’ve cleaned out pots, weeded and removed brambles. From the shed I retrieved a plastic bin with a lid and filled it with nettles and water to turn into nitrogen-rich liquid feed – it gets stinky, but it’s good stuff and it’s free. And I planted a whole raised bed with potatoes and netted these to prevent Max (who I think is some sort of potato hound) from digging them up and eating them. 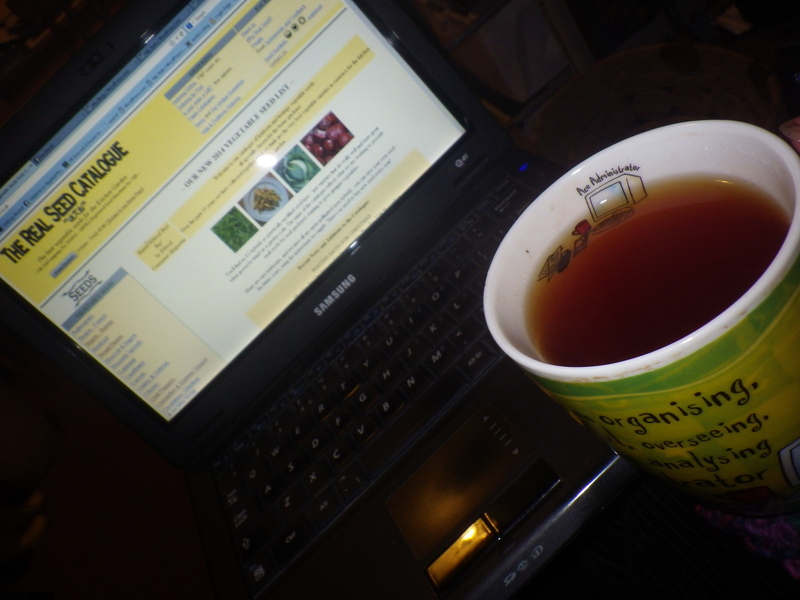 The sun has gone in now, hence finding the time to write, but I am feeling very satisfied with my activities. What have you been up to this weekend? I sowed more seeds over the past few days, including the first ones outside. The latter is a pea variety called “Carouby de Maussane”, a mange tout with red flowers that is going to grow up the pea obelisk that Mr Snail created (I think most people use them for sweet peas, but I prefer to grow edibles). A few days of sunshine has given me the chance to weed one of the raised beds and that’s where the peas are. Unfortunately one of the things that is flourishing in the limery is the cluster-fly population. I really don’t want to use chemical pesticides, but the flies have arrived before the carnivorous plants are doing their stuff. However, the recent sunshine has encouraged pitcher growth and so I’m hoping that soon the Sarracenias will be munching their way through the flies. I grew some from seed last year, so I’m especially pleased to see one of the youngsters producing a vigorous pitcher already. The sundews are also showing signs of growth; in particular the Drosera dicotoma looks like it’s going to be a force to be reckoned with in the very near future (I think of it as living fly-paper). The Venus fly traps are growing too, but never really earn their keep apart from providing interest! Second, new skills. I have been focusing on getting to grips with my overlocker this past week. Using it is not quite the same as using a normal sewing machine, but they say that as we get older it’s good for our brains to learn new things. I’m very happy to say that I’m finally getting more comfortable using it (the overlocker, not my brain) and that I can rethread it without too much trouble now. Third, seedlings again. I am being very restrained sowing seeds so far this year, but the peppers, chillies and tomatoes that I planted a couple of weeks ago are coming through and the tomatoes will need potting up from their tiny modules this weekend. I just love the promise of abundance. I’ve finished the hoodie – several times! First, I decided it was too short. So, I put a stripy border on it, but it looked like an afterthought (which, to be fair, it was). I unravelled that and worked a new border in the mixed yarn to match. All done and worn a couple of times before Sam decided to eat the wooden toggles off it when I left it on the bed. New glass toggles bought, and attached and I’m hoping that’s the last time I need to finish it! Of course, as soon as it was completed it for the final time the weather warmed up and it’s been in a cupboard since! 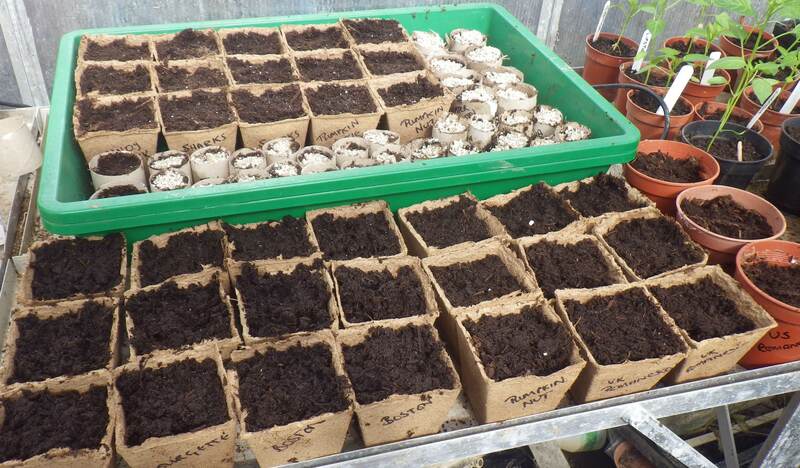 With the warmer weather and all the lovely space in the limery, I have been busy with seed sowing. The peppers, chillies and tomatoes planted earlier in the year are growing, but now there’s lots of pots and trays that we’re watching with avid interest for the first signs of green shoots. Amongst other things, I’ve planted melons, broad beans, coriander, oregano, parsley, courgettes, lettuces and mizuna. There are potatoes chitting and the perennials, including the passion fruit, are growing well. The sunny days have been accompanied by frosty nights, so only a little salad has been sown outside for the time being. Come on little seeds – wake up! On the craft front, I’ve learned how to crochet star stitch and made a dishcloth to practise; I’m working on a pair of stripy socks; I’ve made another crochet snailvaark; I’ve made several mousevaarks from old socks and given several of them away as gifts; I’ve tested out a crochet pattern from my new friend, Danielle, at The Make It Shop; I’ve sourced jute for my crochet bird roosting pouch kits (on sale soon); and I continue to add a row here and there to the crochet sofa cover. And then, I’ve also carried on with my letter writing – using real pen and paper. If you’d like a real letter from me, send me your postal address and I will write to you (can’t promise how soon though). And then, I’ve been doing the laundry, because I’ve finally started sorting the vintage linen hankies and other bits and bobs I’ve been given. I’ve washed and ironed some of the handkerchiefs and I’m currently in the process of describing them and photographing them ready for listing on etsy. It’s very time-consuming, but I really want them to find homes where they will be treasured. However, more regular blogging will now resume! Look at any gardening book and it will tell you when you ‘should’ sow certain seeds. Search the Garden Organic website and it tells you that in August (at least here in the UK), you should be planting (amongst other things) amaranth, chicory, Chinese cabbage, kale, lambs lettuce, winter lettuce, oriental greens, rocket, spring cabbage and turnip. However, Garden Organic were not awaiting their indoor growing space during the spring and early summer like I was. They don’t have all the facts, namely that (1) I bought a whole heap of seeds last winter, (2) Plans for the limery were hatched after purchase of said seeds and (3) I don’t believe everything I read! 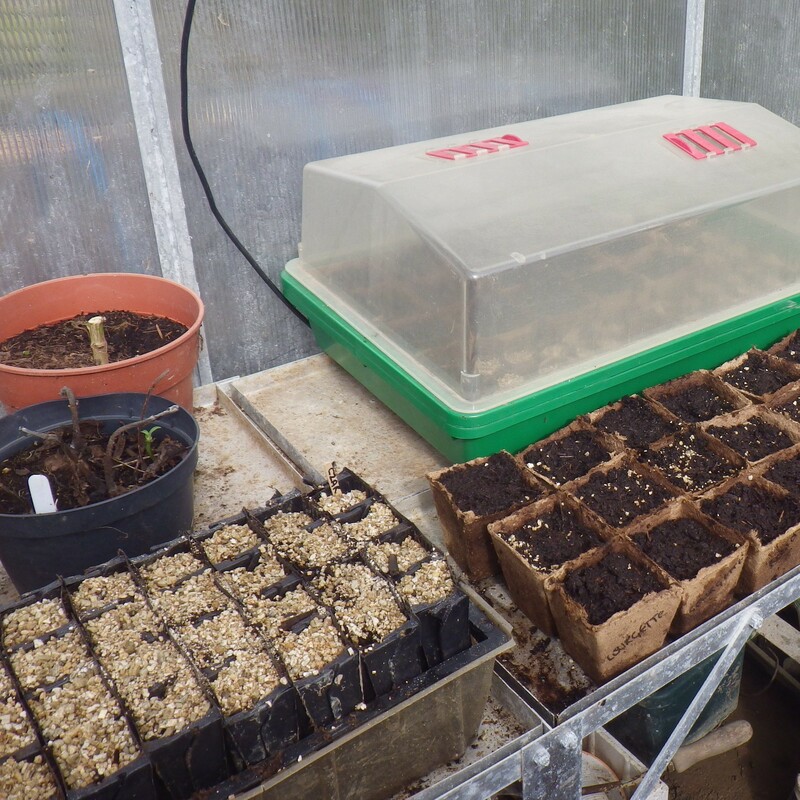 So yesterday I sowed seeds… leeks, parsnips, basil and purple sprouting broccoli. Oh, and kale, which is on the list. All except the basil are in modules or little coir pots in the limery… where it’s warm and lovely. Maybe they will thrive and maybe they won’t. Maybe they will be so shocked when they are planted out (not the basil, that’s staying indoors) they will keel over, but maybe they will have had such a good start in life that they grow into be healthy plants and give us a stupendous crop.We will see. 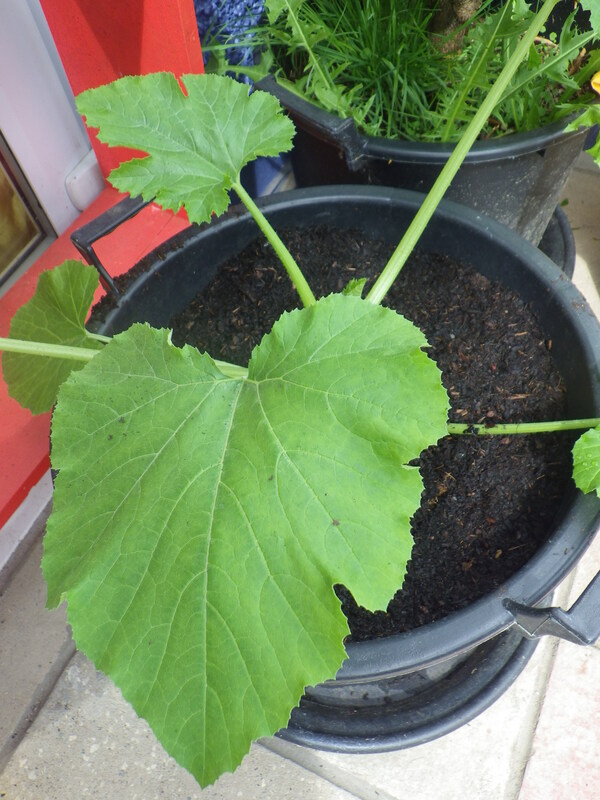 A couple of weeks ago I planted three courgette seeds – only one germinated, but that has grown into a large plant in the limery, so yesterday that was potted up into a very large pot in the hope that, by keeping it indoors, we can have some completely out-of-season courgettes. Because of the poor germination, I also sowed a couple more seeds last week (a different variety) and both of those have germinated even though they were a year older than the first ones. The variety is large and probably totally unsuitable for indoor growing, but, again, we’ll see. I have really missed my glut of courgettes this year, so it would be lovely to have at least a little crop in order to re-live past harvesting glories. Maybe I’m just over-optimistic, but there is such a joy associated with the transformation from seed to plant to crop to dinner on my plate that I simply couldn’t wait until the ‘right’ time! It’s now the time of year when I do a big shop. No. I’m not talking about stocking up for gluttony over the festive season, I’m talking about seeds. I think about the successes and failures of the past year. What do I want to repeat? What worked well? What was a disaster? And I look to the future – always trying something new each year. I find the idea of a new growing season particularly uplifting. It’s not many weeks now, in fact, until I need to start planting chillies and peppers, which benefit from a very early start, even though we are still harvesting fresh chillies from both of this year’s varieties: Lemon Drop and Alberto’s Locoto (both of these are on the list to grow next year). In 2014 I’m also definitely going to grow Yellow-podded Mangetout, Lipstick Pepper, Lady Godiva Pumpkins, Lady Godiva Sunflowers, Mira and Colleen Potatoes and Mizuna. What about you? Or if you are in the southern hemisphere, what’s doing well for you now?